Click image to download the fullsize image (1024 x 768 pixels). Here’s my favourite wallpaper just now. 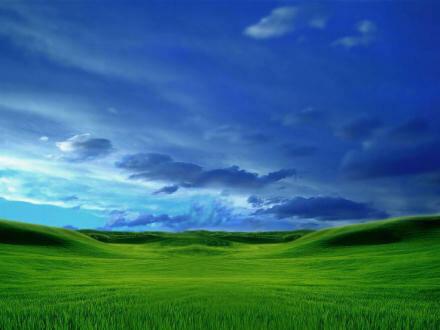 It’s like the Windows XP “bliss” wallpaper, but a little less Tellytubby-esque. It reminds me of The Shire, from the Hobbit and The Lord of the Rings, and looks quite spectacular on my laptop. Since buying my Lenovo 3000 C100 laptop back in July I’ve been installing all sorts of rubbish on it (such as beta versions of Internet Explorer 7, Microsoft Office 2007 and … stuff) secure in the knowledge that with the Lenovo Care “Restore to Factory Settings” feature a clean, happy and thoroughly redeemed system was but a click or two of the mouse away. And Friday evening was Redemption Day for my laptop. I pressed the power switch and watched the laptop boot up … at the “Lenovo” screen I carefully pushed the “Lenovo Care” button and once the application had loaded I selected the “Restore to Factory Settings” option and left it to it. About an hour later, and after a little intervention from me — just to answer some basic questions such as “do you want to continue?”, “which country do you live in?” and “what is average air-speed velocity of an unladen swallow?” — I had a laptop that was as good as new. When I say “good as new” what I really mean is that when I rebooted it everything was just as it was the first day that it arrived. What I don’t mean is that it was running as efficiently and as optimized for speed as it is now. Lenovo Care will only take you so far, I guess. But I am most thankful that XP is now running fine and that I didn’t have to reinstall all the system and drivers peripheral drivers. For the last couple of days (and evenings) I’ve been busy removing most of the pre-installed software from it: Diskeeper Lite, Norton Internet Security Suite, Google Toolbar (with built-in Lenovo branding), Google Desktop and carefully working my way through the TweakGuides guide to setting up Windows XP. I’ve used this four or five times now, when setting up and tweaking XP and it is excellent. Naturally, I don’t follow all his advice, but I must carry out about 90% of what he recommends. As a footnote to the reinstallation post, the more I use my Lenovo laptop the more I appreciate the thought and effort that has obviously gone into building it. I know that a lot of OEM laptops have the “Restore to Factory Settings” feature, this is just the first that I’ve used that I’ve had absolutely no trouble with whatsoever. The Lenovo System Update too was effortless to use. It connected to the Lenovo support website, downloaded the latest drivers and BIOS updates (potentially risky, I know) and installed them all without a hitch. And if you really wanted to reinstall everything manually then I’m delighted to report that the drivers download information on the Lenovo website is clear, excellently laid out and very well documented. 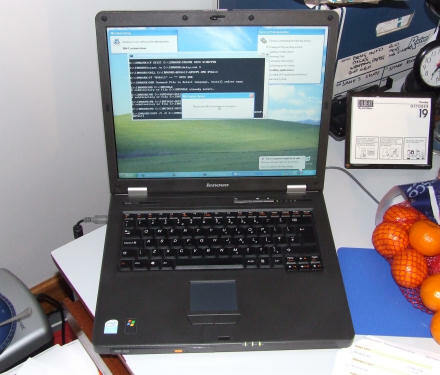 All in all, I’m delighted with my Lenovo 3000 C100. It may not have the graphics card oomph to run any of my running-jumping-shooting people games. But to be fair, that’s not what I bought it for. I’d recommend a Lenovo to anyone.